Hello friends! 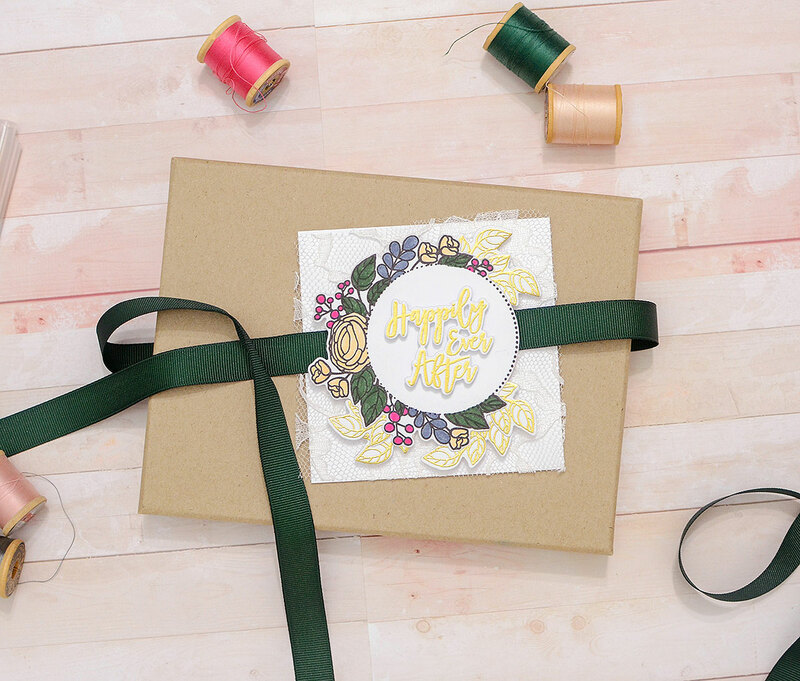 I'm sharing a post that ran on the Papertrey Ink blog yesterday as part of my monthly Packaging Ambassador series. 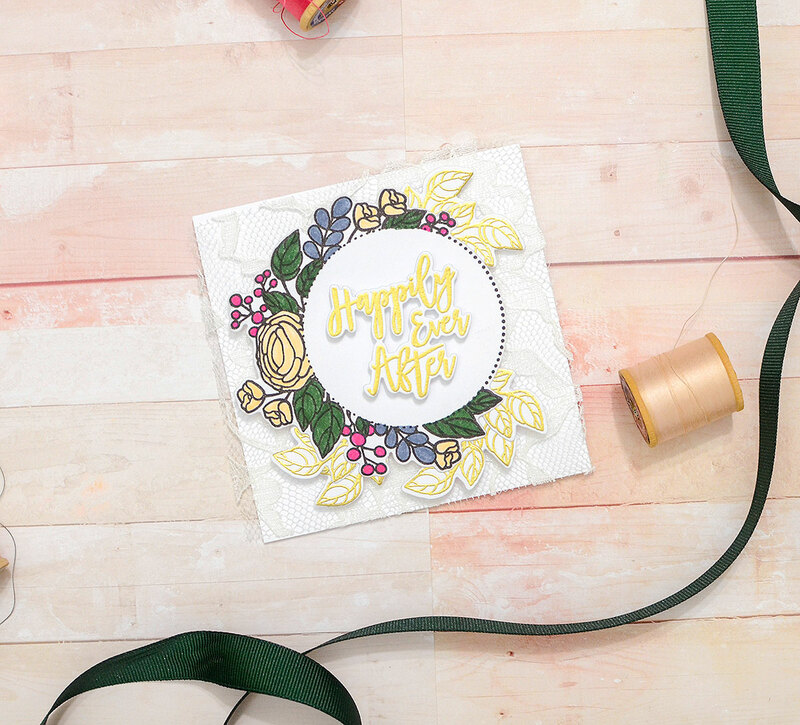 Today's idea will definitely appeal to all of you card makers out there. Even if you hate wrapping gifts, I think you'll enjoy this one! Let's take a moment to consider the cards we make to accompany the gifts we give. We generally spend a good amount of time creating something that comes from the heart. Even when a card is pulled from a pile we've had on hand for weeks or months, that card was made with our own two hands. We write a nice message inside...then stuff it in an envelope. But what if we didn't hide it in an envelope, and instead, we made it the centerpiece of our gift wrap? Try it with me! You'll need to make a card first, of course. The good news is that this can also be done with cards you've already got stashed away, and I'll talk about those a little later in the post. For now, I've made a card especially to top off a gift. I used the gorgeous floral frame from Circle of Love and I even got out some brush markers and colored in those pretty blooms! I stamped a few extra leaves from the same set, embossing them in gold and then die cutting them. I placed them strategically around my die cut circle, adhering them on the back of it. I also stamped, embossed, and die cut the phrase 'Happily ever after' to place in the middle of the frame. The frame is the perfect size for my favorite card size--4" x 4". Before attaching it to my white base, though, I added a cover of off-white lace to the card--I've got to have a little texture! 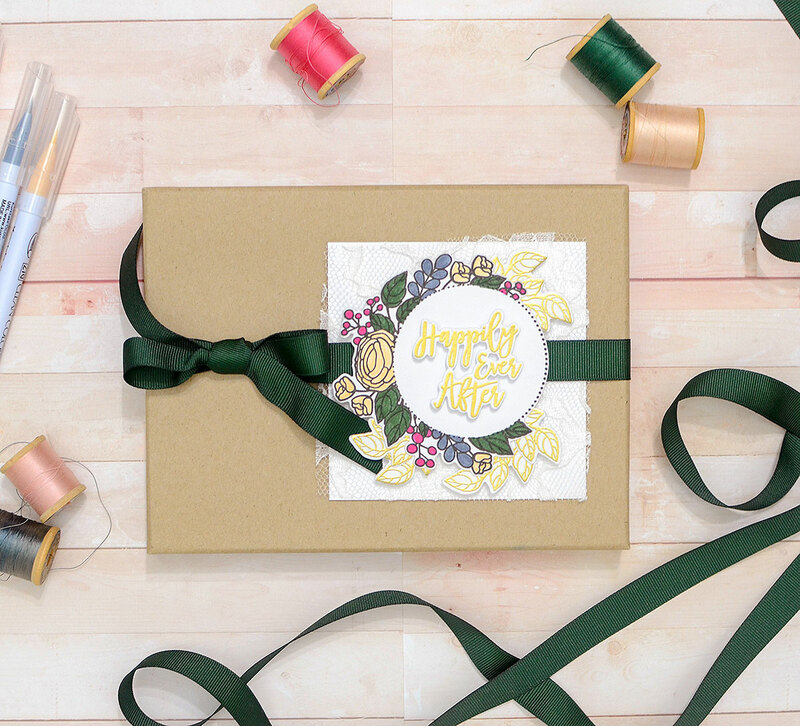 When planning my card and gift wrap, I thought it would be convenient to allow for the ribbon I tie around the gift box to run through the design of the card somehow. That way I'd be able to attach the card to the gift and it looks like a proper tag or decoration. 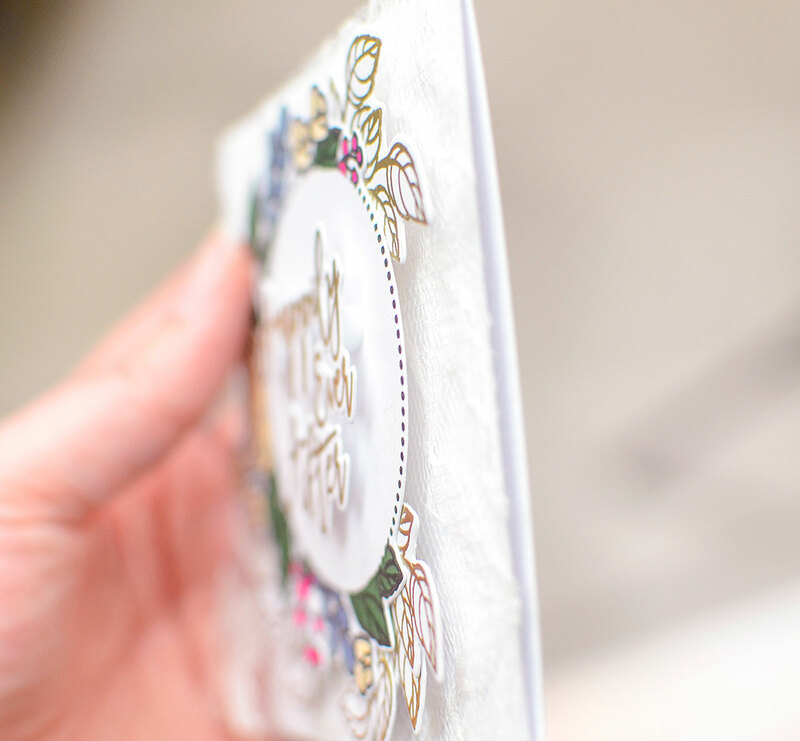 With that in mind, I used 3D foam adhesive dots to adhere the floral frame to the base of the card. I just made sure not to put any dots in the center of the frame, leaving a path wide enough for the 5/8" Pinefeather grosgrain ribbon to pass through. After sliding the ribbon through, I tied a pretty bow next to the card and the gift was complete! It's definitely a fun way to showcase the thoughtful effort you put into making the card, and you don't have to pull double duty by then creating a separate tag (or several of them, as I've been known to do). This is also a great trick if you're short on time or if you (gasp!) don't love to wrap! And what if you don't have time to make a card or already have a card that is perfect for the occasion? It's fine! 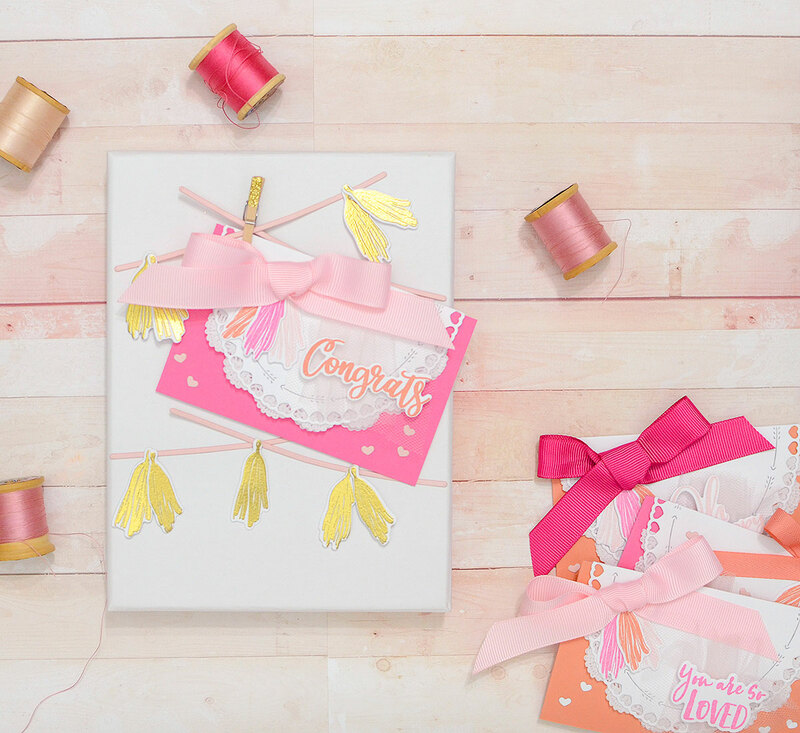 Almost any card will work as a gift topper, and if you simply want to tie string or ribbon around the box and clip the card on with a mini clothespins, that is really ALL you have to do! I promise! That said, you can spice it up a bit, too, but only if you want to. I'm turning to a set of mini cards I made back in February for that. 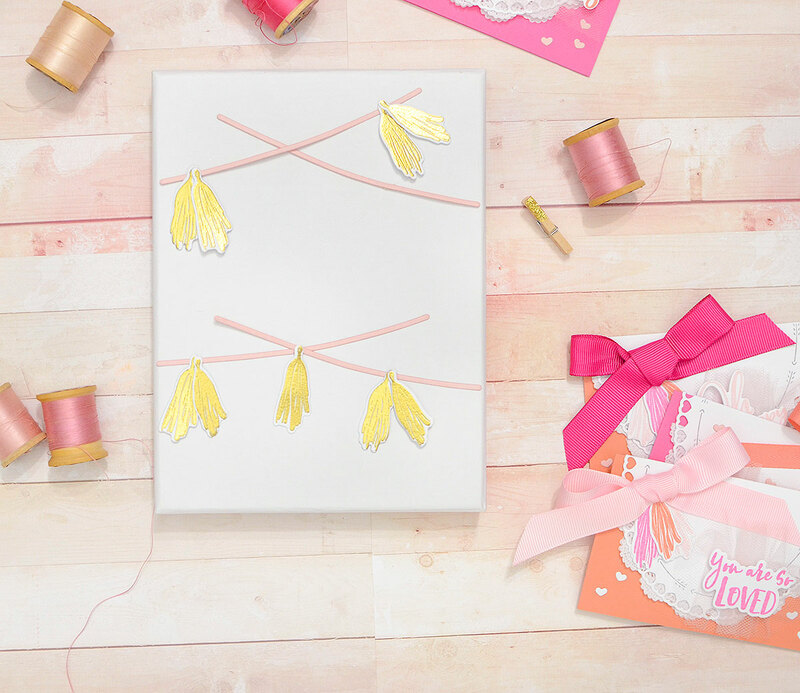 I'm here for my packaging ideas so I had a little fun with this one, drawing on the tassel theme of the card set. 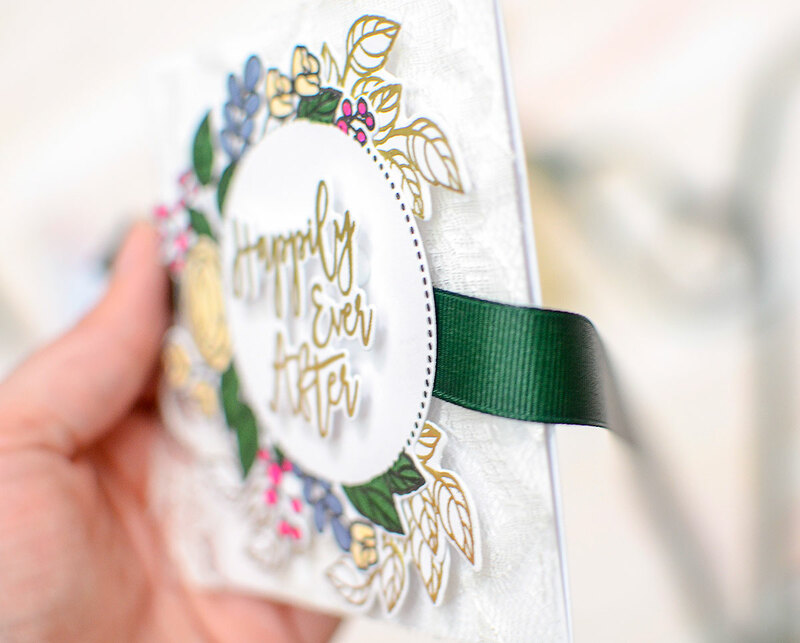 I die cut four of the "strings" from the Worth the Wait die collection, followed by several tassels which are stamped and embossed in gold. I used mini glue dots to attach the tassels to the strings, and because the strings are skinny, the dots also keep them in place on the box. I attached one of the mini cards to the lines with a bitty clothespin I half-covered in glitter. The tassels are placed on the lines around the card, kind of like a celebratory banner or garland you might see on the wall at a party. 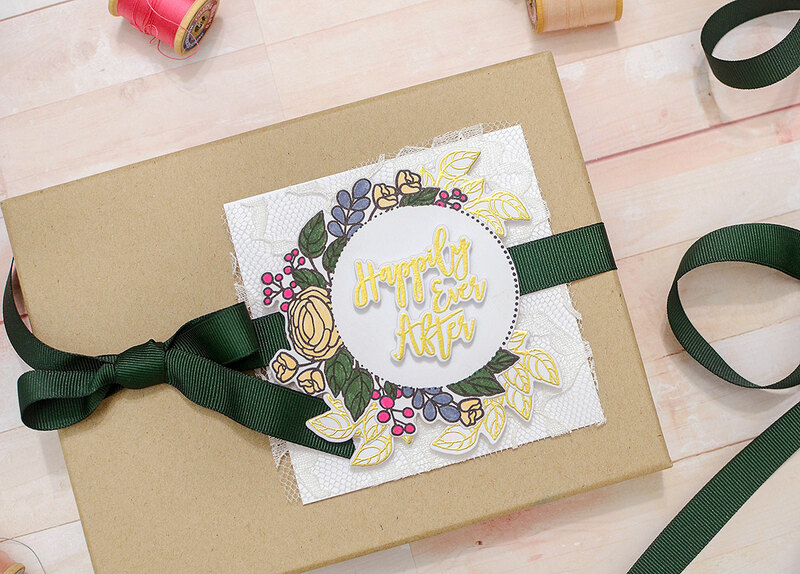 You don't have to re-create this gift, but you can use the theme of your card to have a little fun with the gift wrap, all the while keeping your work of art front and center! 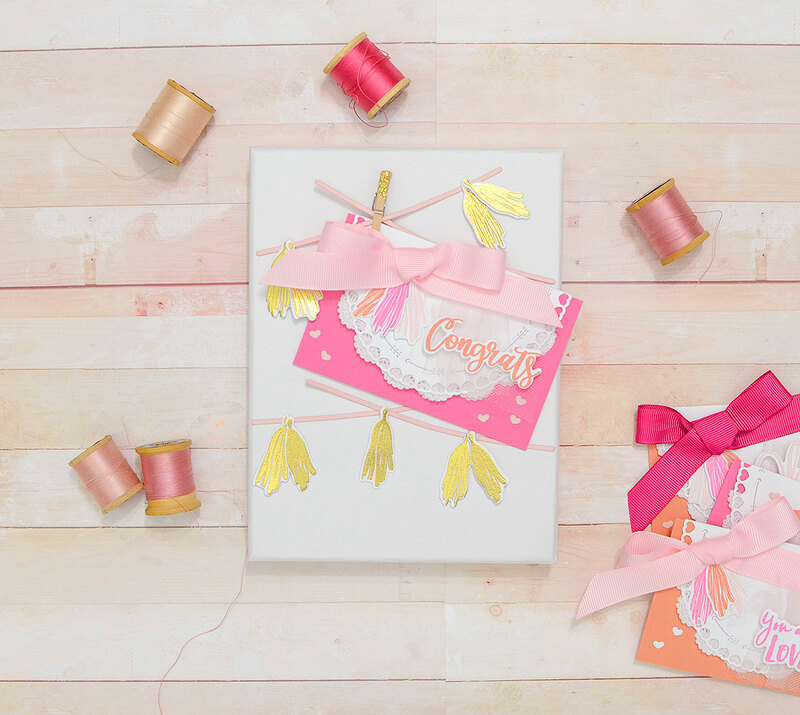 Do you have any cards that you'd like to use in your gift wrap? It really is a shame to hide them in a dark envelope, so think about getting them out and letting them shine like the stars that they are! I'll meet you back here next month! *For Tassel Mini Card set details and full supply list, please refer to THIS post.